Make the clown start moving in a new random direction and slightly faster. Open up the clown object window and add a new event. Click on Mouse and choose Left Pressed. 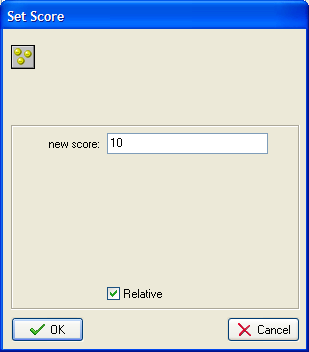 Drag in the Set Score icon (look under Score) and fill in the window as shown below. By clicking the Relative box we add 10 to the score. Otherwise the score will always be 10. Drag in the Jump To Random icon and press OK in the pop-up window. 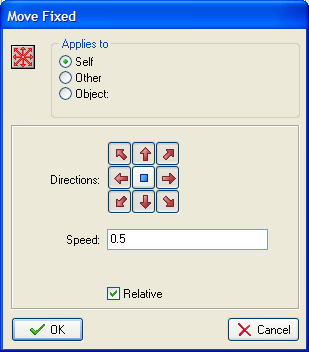 Drag in the Move Fixed icon and fill in the pop-up window as shown. Notice how we are adding a small amount to the speed each time the user hits the clown. This makes the game more difficult the more successful the player. Save your work and test the game at this stage.